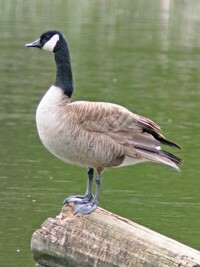 Primarily an herbivore, the Canada Goose is a water bird native to North America. It has a black head, long black neck, white cheeks, a brown body and webbed feet. It is often seen in flight moving in pairs or flocks. 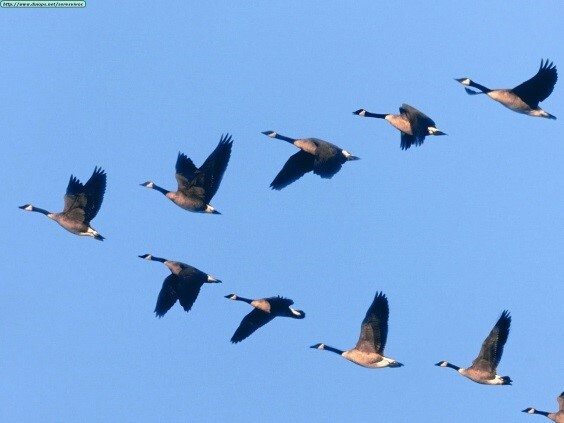 Flocks often assume the “V” formation when migrating in the fall season. Migration begins when the soil starts to freeze on their breeding grounds. Breeding happens from April to May and the female goose will lay approximately 2-10 eggs with goslings hatching about 28-30 days later. As the goslings grow, they will stay with their parents for a full year at a time and will return with them the following year, after their migration. Due to over-hunting and loss of habitat in the early 1900’s, the Canada Goose was thought to be extinct by 1950. In 1962, a small migrating flock was discovered in Rochester, Minnesota. With help from the Northern Prairie Wildlife Research Center, by 1981 the species had made its come back. It breeds in Canada and the Northern United States – the Great Lakes region maintains the largest population. Spends its winters migrating in California, South Carolina and Northern Mexico. The Migratory Bird Convention recognizes that birds may sometimes cause damage and danger, and provides management tools to reduce those conflicts – migratory birds, their eggs or nests may NOT be harmed without permit! In captivity, the longest living goose is known to be 80 years old. In the wild, the oldest goose was reported to be 30 years.